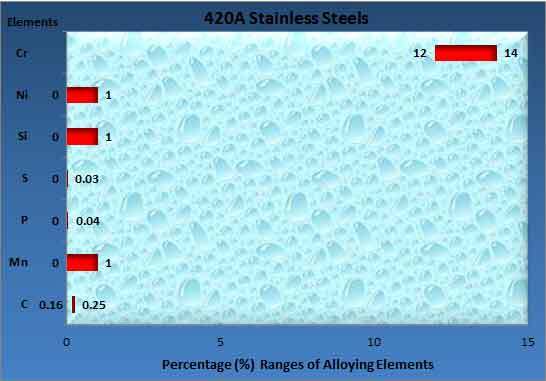 What are 420A Stainless Steels? 420A is the second martensite grade steel with higher hardness than the primary 410 stainless steels defined in the standard. This can be hardened afterwards by heat treatment, this has got more Carbon than the 410 type of stainless steel. Dimensional Characteristics of 420A Stainless Steels: The applicable thickness in millimeters for this 420A Stainless Steels ranges from 0.25 to 4 whereas the width in millimeters is from 600 to 1200. Moreover outer diameter of pipe in inches ranges from 0.5 to 8. In the case of rod the diameter in inches is from 1 to 8. Crux: Other mechanical properties of this type of steel & its family is highly maneuvered by heat treatment methods and therefore not specifically defined. Since the standard also share a generic view therefore in this writeup it reflects the same. More details can be sought in comments section. Hardness in HRC as specified in the standard is from 48 to 53. In JIS standard, the equivalent material is referred as 420J1 type steel. In DIN standard, the equivalent material is referred as 1.4021 type steel. In ISO standard, the equivalent material is referred as 420A type steel.